It’s a two word phrase every mother’s heart never wants to utter, never hear from the lips of a physician treating their child. When the words apply to an infant, a baby girl, before she’s every taken her first step, eaten her first bite of cake, it seems that the universe has taken a cruel turn and somehow is destroying every hope and dream that you envisioned for this new life. Alice and I at Christmas, 2016. Still… she does. 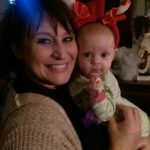 My baby grandaughter has cancer. Neuroblastoma is a rare form of pediatric cancer, a solid tumor that most often appears in infants and toddlers as early as birth. There are around 700 cases of neuroblastoma in the United States annually. It’s often diagnosed as a child celebrates their first, maybe second birthday. There are no tests that a parent can ask for screening or to be aware that a tumor is silently growing somewhere in their child. Alice in June, 2016, a few weeks before her illness and hospitalization. Alice Marie is the daughter of Army SGT Clayton and Shea Gerrian. She was welcomed into the world as a healthy full term child, her mother receiving excellent prenatal care while experiencing a healthy pregnancy. There is a very limited history of cancer in the family. 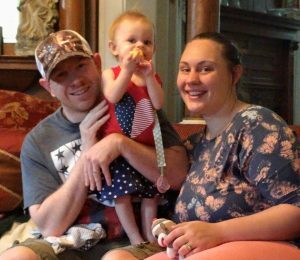 While Clayton is a dedicated solider, Shea leads a support group for Moms in the Fort Meade community who all have infant children born in the latter half of 2015. 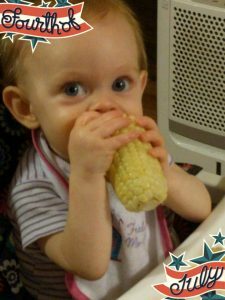 The friends and coworkers at Fort Meade were startled to learn that Alice Marie’s stomach virus translated into a fight for her life. Alice contracted a gastroenteritis virus on a trip from her to Seattle to attend her aunts wedding. Once home, Alice couldn’t stop vomiting over a 48 hour period. Her parents rushed Alice to a nearby hospital around 11p.m. In the emergency room, a standard ultrasound for potential blockage in her bowels found a strange shadow at the base of her spine in sacral area. At first, it appeared to be a cyst. I caught the first plane from Indy to D.C. the following morning. Alice was transported from a regional hospital in Anne Arundel to John’s Hopkins in critical condition as I arrived. Further testing revealed that the cyst was actually a solid mass, a tumor of unknown make up. There were so many doctors. Attending physicians, fellows, and residents. They spanned every disapline, at times contradicting each other. Days progressed. You lose track of the outside world. Alice’s care was transferred to Dr. Eric Jellin, the Harvard Medical trained pediatric attending (that means “head honcho”) surgeon for Johns Hopkins Children’s. All at once, the struggling information and conflicting messages stopped. Johns Hopkins staff simply fell into sync, proving they deserve the titles and accolades. After a week of treatment, IV fluids and extraordinary care, Alice was finally stabilized and rehydrated, able to ingest and digest breast milk in small amounts. She was strong enough to have the first tests to determine what the tumor could be. Our Alice started to shine out from those baby blues. The MRI under anesthesia provided clear indication that the tumor mass had grown in her pelvis, between her backbone and colon, invading the nerve canal in the triangular section of the sacral vertebrae that houses “lots of important nerves,” her surgeon said. At 2.6 cm, it spanned a great distance in her small body. As America prepared to celebrate Independence Day, my daughter, son in law and I stepped out of a week long hospital marathon, into the sunlight of day and shadows of fear. We’d left Wonderland for the hallowed halls of Johns Hopkins Children’s Center and nothing, literally nothing, seemed to make sense. Sweet Alice Marie traveled with her parents and I from Baltimore to Rushville in an easy overnight journey that her physician said posed no risk. This is home, our historical house on Harrison Street, in a place where rural values, neighbors and belonging are intrinsic parts of life. Even though they’re stationed near Washington D.C., all the best things in life still remain in Rushville, Shea always tells me. This is home. It’s not just a place we live. It’s the way we live. Alice came home. She watched fireworks from the front porch, and clapped her tiny hands at the fountains of colorful sparks that showered the front lawn. She played with her tween age “aunts and uncles” who were happy to see the little monkey girl, their sister and brother in law. We spent time together. It’s the most important thing….time. 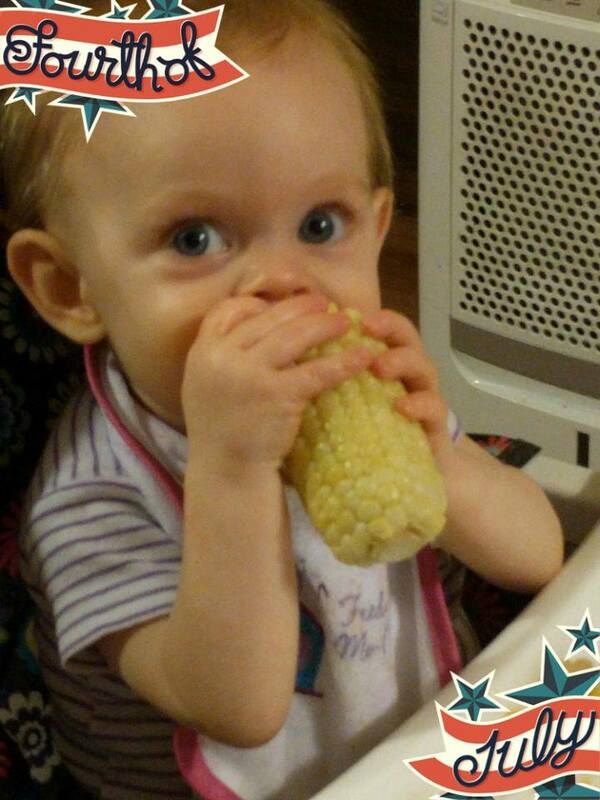 Alice had her very first Indiana sweet corn on the cob, and found her appetite again. She’d lost a full pound in such a short time. Alice laughed and played. Did I tell you that my granddaughter has the most beautiful blue eyes, and a smile that wrinkles her nose? Everything about her breathes life, from the laughter that bubbles over, the wriggling toes, and her little vocabulary of ‘up,’ ‘this’ and “thank you.” It’s amazing to me how quickly this tiny human has twined my heart around her little finger. She loves apples, crunchy green beans, and can bear crawl. She’s working on her first step. That short span of days, celebrating life, seemed as sweet as the previous week had been harrowing. And reality came back to remind us… pediatric cancer. It was with us, the whole time. Alice’s Dad, SGT Clayton Gerrian, is an active duty Army NCO. 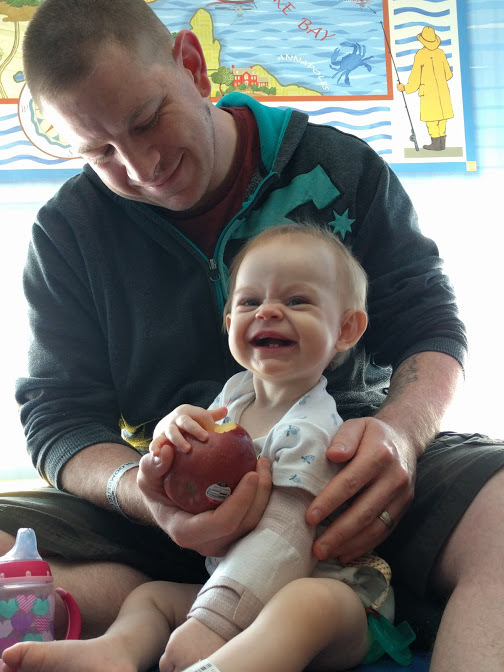 Alice enjoys sharing apples with her Daddy. The few days in Indiana were shortened by a call from the surgeon. 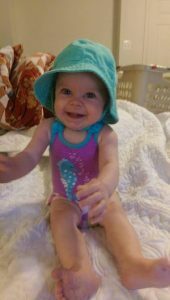 We returned to Johns Hopkins for more tests, and Alice was scheduled for a surgery to remove the majority of the tumor on July 12. 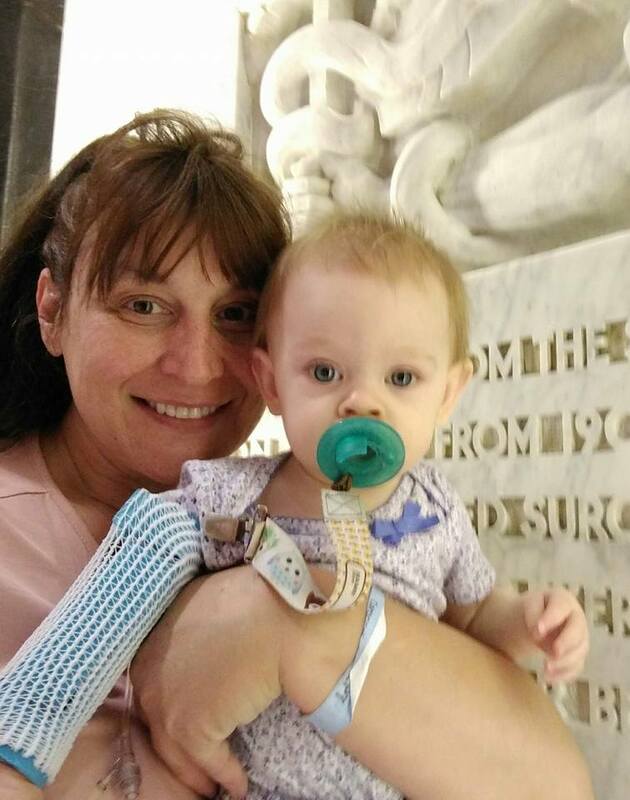 Unfortunately, the MRI hadn’t reflected the concentration of nerves that twine through the tumor, including the vital connections of bowel and bladder control, and movement of her right leg. In the surgical suite, Dr. Jellin along with his team…. a neurosurgeon, interventional radiologist, and neuropathologist, made the initial diagnosis. They removed less than 25% of the tissue, and closed Alice’s minimal incisions without proceeding to a larger surgical approach. The tumor cannot be removed without catastrophic consequences. Life at Johns Hopkins became routine very quickly over the ten days we lived there. We understand that it’s the first of many journeys. You learn the pathways and halls, and find those special corners that outline history making advances in medical care. We found the portrait of Dr. Blalock, who pioneered open heart surgery in infants, the ‘blue baby’ operation. In little known places there are fountains and fish, machines that make colorful bubblesand, and starry screens that burst into motion, light and color as you move. You learn to trust in the people that come to care for that tiny human, her fourteen pound frame so tiny against the medical landscape. The signs and symptoms of neuroblastoma depend on where the tumor is located. Because they are similar to symptoms of other much more common childhood illnesses, it can take many months for a diagnosis of neuroblastoma to be made. 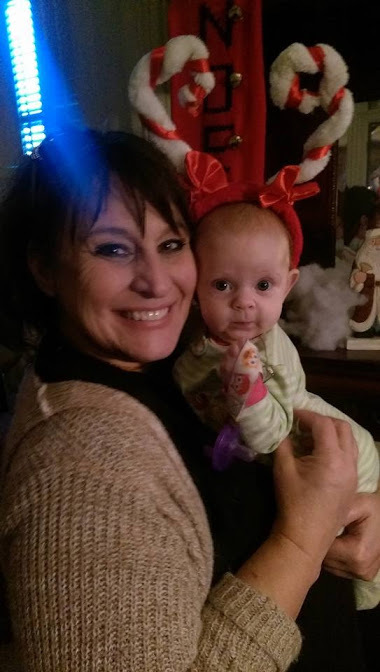 Alice and her Mom, Shea. 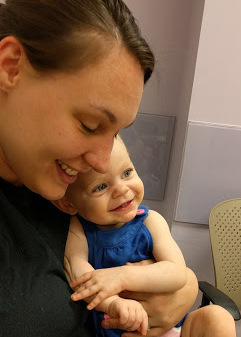 Alice’s smile was for Dr. Jellin, the amazing pediatric surgeon leading the fight for Alice to grow up healthy. Fevers, typically frequent and low grade. As the disease progresses, the tumor can literally crowd out the intestines and organs, distending the stomach. Neuroblastoma isn’t in the brain. Instead, these cells that were once intended to be nerve tissue. This kind of cancer feeds on the proteins that the body needs to produce an effective immune system. Because it’s part of the child, the immune system never attacks the tumor, but slowly fails as the tumors advance. There are three categories of risk assigned to neuroblastoma patients, and stages within each of the risk groups. It’s complicated, alien language that most parents and grandparents will never entertain. Yet for the 3500 children that are or have faced the fight against neuroblastoma in the past 72 months, there are still hard discussions to confront. Stem cells. Clinical trials. Statistics and rates of reoccurrence, which are so very high. Treatment options, bone marrow aspirations, nuclear studies, DNA testing of tumor tissue, markers. It seems to never end. At times, I think that we are all trapped in a Wonderland nonsense dream. It’s consumed my every waking moment and most of my dreams in the past month, these few weeks while the world did a complete flip. I’ve learned that I am really angry with people who throw their lives away, while Alice Marie and those children like her never have the chance. I’ve participated in impossible discussions. Imagine a conversation regarding harvesting the eggs of a nine month old child to preserve her ability to have a child later in life? With the location of her tumor in the pelvis, even targeted radiation will end her choice to have a baby, when…not if…she wins this fight and grows up to live an amazing life. Still…. How do we process this fear? How can this be happening to the most innocent, sweet child that I’ve known? For me, it’s projecting the sequence of the fight. Knowing the details. Limiting the surprises. Trying to breathe in, cuddle the baby and offer all the support and stability I can to her Mommy and Daddy. I started a GoFundMe page, not realizing that the few short weeks would be only the beginning, that the hundreds of dollars spent over a few short days were only drops in the bucket in contrast to the mountain of financial stress headed our way. I know that Alice will have what she needs. Many of us willl work tirelessly to make sure of it, allowing her parents to do that really important work. Love and nurture Alice Marie. Alice is returning to Johns Hopkins Children’s Hospital soon. After that, we’ll know more about her ongoing treatment, possible chemotherapy and the journey from this point. We do know that she’ll be surrounded by children who are facing tough challenges, and sayings like #AliceStrong. Alice will fight that good fight with her Mom, Dad, Nana and a wealth of family and friends to encourage her. With any luck, she’ll grow up to understand that she fought cancer and beat it, no matter when or if it comes back to haunt her childhood. Anger persists as well. Anger that she was born to parents that literally did everything they could to ensure her health and well being, that her life since birth has been full of balance, love and healthy everything. Anger that no matter the care, this black tumor has been stealing her health and well being, creeping in like a snake in the grass, an unwelcome intruder. Understanding is beginning to dawn. People we never expected have reached out to support the fight, and those you might expect to be standing close have simply faded, uncomfortable with the reality of her plight, or perhaps just to busy or unable to understand. In truth, I respect the fact that it is not their fight. For those of us who’ve chosen to love Alice, there is nothing to do but give everything. 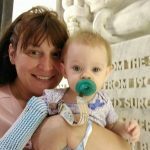 The research I’ve conducted so far indicates most neuroblastoma patient families with insurance need to raise over $100,000 for travel to medical facilities, alternative therapies including specialized nutrition, changes in living conditions that promote sterile, healthy environments after chemotherapy, etc. You have to stop and wonder how these families with children facing second and third relapses of neuroblastoma find a way to function. Once new friend in the fight was waiting for his son with us as Alice was under anesthesia. He said they’d literally been to every major pediatric center for cancer treatment over a span of several years. Somehow, we must follow the proverbial white coated rabbit through a new version of Wonderland….believing those blue eyes bubbling with laughter will emerge from this into a life full of happiness and love. Join us in keeping #AliceStrong.